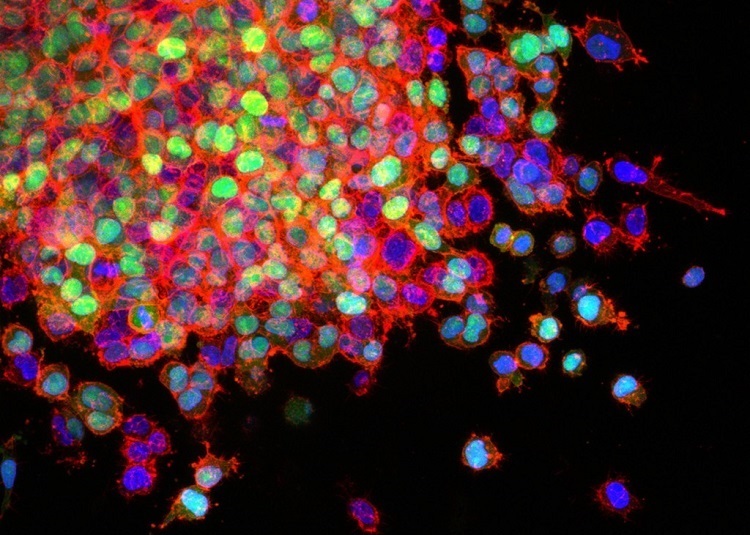 Lung cancer cells invade surrounding tissues. Image courtesy Scott Wilkinson and Adam Marcus. A group of computational biologists has used innovative software to ‘map’ interacting genes disrupted by disease. Their results pave the way toward targeted medical treatments. The researchers analyzed genetic interactions in 394 different human cell and tissue types. Genetic associations were used to relate groups of interacting genes to psychiatric, neurodegenerative, and immune-related diseases. Observing genes in this way gives greater understanding of disease processes. The risk of a person developing a complex disease such as cancer is influenced by their genes. Advances in genome-sequencing technologies have enabled researchers to compare the genetic variations between people with a given condition, and people without. However, the mechanisms by which these genetic variations impact upon disease processes remain largely unknown. Research spearheaded by the University of Lausanne and the Swiss Institute of Bioinformatics (SIB) used innovative software to construct gene network maps that will increase understanding of how diseases start and progress. The findings were recently published in Nature Methods. The researchers used data from the Functional Annotation of the Mammalian Genome (FANTOM) consortium. They examined almost 400 different human cell and tissue types -- the most ever analyzed at one time -- to determine the networks in which genes interact for a given disorder. To analyze this data they developed a new software tool called Magnum, which they have made freely downloadable. Using Magnum, the team was able to map networks of interacting genes with unprecedented resolution. Then, using genetic associations from public data, the researchers were able to relate the genes to 37 different psychiatric, neurodegenerative, and immune-related diseases. Their results showed that genes that are associated with a given disorder tend to cluster in groups. In this way they are connected in networks, and specifically in networks of tissues that are relevant for that disease. In cases of schizophrenia, for example, the strongest clustering of disease-associated genes was observed in networks of brain tissues and in structures that are known to be targeted by current medical treatments. The network-based approach is promising because of this clustering of genes in relevant tissues. Each network acts as a ‘control system’ for the cells or tissues by outlining hundreds of thousands of regulatory interactions among genes. Studies like this could drive progress toward better diagnostic tests and targeted treatments that will be more successful and have fewer side effects. Observing individual genes and groups of interacting genes further could give a better understanding of disease processes and mechanisms.